I have always been a fan of Casey Jones, he was awesome in the original movies and now one of my favorite actors (Stephen Amell ) is playing him. So of course Playmates gives us an action figure of him so lets check him out! If you have been buying the Nick Turtles toys you what to expect from the packaging because it hasn't change for the new movie line. The packaging has a yellow and green background, with the log at the top and a picture of all the Turtles on the top left. You have Casey Jones clearly displayed in the middle with his name located right below him. 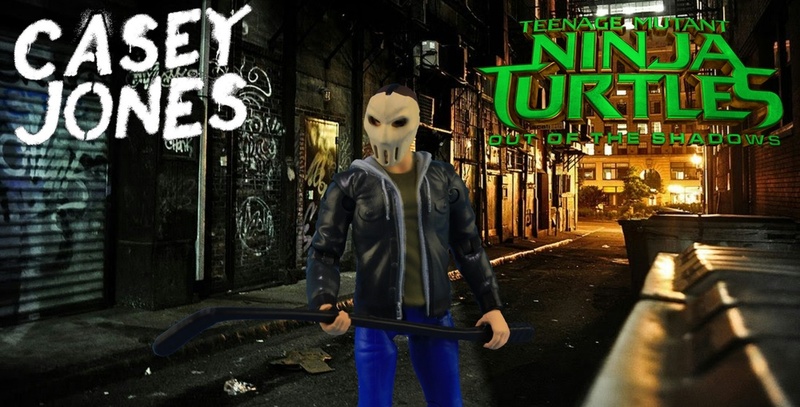 I have to say i do like the Casey Jones figure. I am a little sad that the hockey mask doesn't come off to show us Stephen Amell underneath. Overall the figure himself is very nice and you can get him into some good poses. Have to say one downside is he only comes with one weapon, a baseball bat and a bag would have been nice. Time for some Toying Around!!!! Today we will be taking a look at the new Ninja Turtles Classic Collection based on The Secret of the Ooze movie. So we are getting a new Turtles movie and along with it a new toy line, For the 1st time ever we will be getting Kraang in the movie so of course we have a new toy to go along with it, so lets check it out and see how it is.